On this day trip we will visit Essaouira or the pearl of the Atlantic, this world heritage city, maintaining the charm and authenticity of a land lost in time. Essaouira has become an essential stage in your trip to Morocco. Essaouira was a Portuguese city that left corners full of history behind its wall. Not only its interior is splendid, its beach full of beautiful kilometers of coastline to the south. Let yourself be carried away by the time in its quiet and pleasant streets. The excursion to Essaouira will start with the pick up of the hotel or riad where you are staying. Then we will head towards the coast to reach "the Pearl of the Atlantic"
During this journey we will travel through immense forests of the well-known Argan, where we will stop at one of the cooperatives where the Argan oil is made, so used in beauty, cosmetics and wellness products. 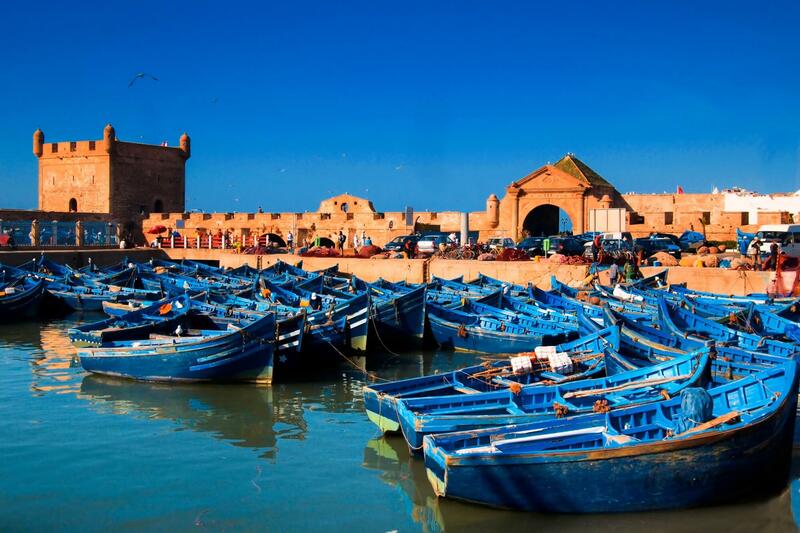 Once in Essaouira you will have free time to admire its strength, the fishing port, the labyrinthine medina, the endless beach, see the daily life of its inhabitants and, why not, taste the delicious freshly caught fish and seafood. There is a possibility to go on the beach on horseback, on a dromedary or on a Quad. The contrast between its dunes and the extensive sea will take you to a state of relaxation that will replenish your energy to continue discovering the most beautiful corners of Morocco. We will be back in Marrakech around 7:00 p.m.